Jeannine, over at Kinder Kouture has just the thing. I love this, it is so bright and colorful. As I commented to her, it reminds me of a new box of crayons. And no thread on the floor!!!! 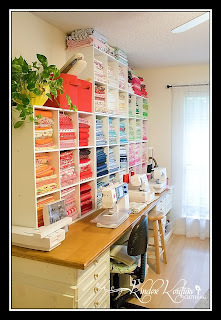 The same can not be said of the sewing room here. But I have some time until Miss Snooty Pants comes home for Christmas. 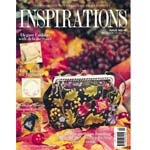 Thank you Jenny, for pointing out that Wee Bear can be found in Inspirations Issue #44. It is called Debut on page 46. I like my name better, but last time I checked Margie Bauer does not have me on the editorial staff at Country Bumpkin. Think of the treasure she is missing. Thanks for the write up. I love a clean room, it really makes me want to sew. Now if only I can get the rest of the house clean, tomororw I will be a sewing! LOL. Love the fabric wall.... I guess WHEN I move I can plan something like that. I was dreaming about cubby holes last night! A surprise at my door. Have you been watching PR?